ESSEX — Essex Boat Works, LLC and Carlson Landing LLC received a unanimous vote of approval on the proposed application for the Carlson Landing Project at the Essex Town Zoning Commission Meeting held on Monday, Aug. 21. At the meeting, three applications were approved: an application for a Special Exception to construct a new building for marina and accessory restaurant along with accessory site work; an application for Special Exception to allow a restaurant as an accessory use as a marina located at a lot known as Assessor’s Map 47, Lot 21-1, Main Street, Essex; an application for Coastal Area Management site plan review for vacant property known as Assessors Map 47, Lot 21-1. A.J. Shea Construction of Essex, CT has been contracted for the Carlson Landing project and expects to break ground in the coming month upon the final written approval and as permitting allows. 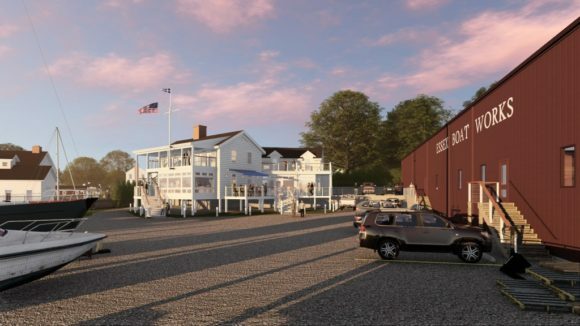 The 7000 square foot, two-story marina/office building and restaurant is the first restaurant to be developed on the Essex waterfront in over 20 years. The restaurant, accessed by Main Street will feature waterfront indoor and outdoor dining with an occupancy of 55.